The flag, above, shows the symbol of the National Heritage Memorial Fund (NHMF). All three working typefounding businesses at the Type Archive were functioning when they were separately purchased for the nation in 1992 and 1996. Mechanical engineering has made us who we are and what we do. In Britain, engineering is a still a Cinderella, despite its inspired mechanical engineers. We seek to enhance its reputation here. The Type Archive at 100 Hackford Road, London, SW9 0QU holds three major typefounding collections (some 8 million artefacts), two funded in the 1990s by the National Heritage Memorial Fund, and the third by Juliet Kindersley. They are akin to industrial jewels, letterforms demonstrating the role that supreme mechanical engineering and type design have played, over six centuries, in the develop­ment of human communication throughout the Western World. In 1819 a new typefounding firm in Sheffield, Blake Garnett (later Stephenson Blake) bought the hand-typefounding materials of William Caslon IV, of the famous family of type designers. It proved a momentous step. The partners were both skilled craftsmen : one a silversmith, the other ‘Sheffield's best filer’. Cutting steel punches by hand was slow and exacting work, requiring rare talent, and typefounders traditionally passed on their precious materials, down the centuries, by descent, or purchase within the trade. By 1937 Stephenson Blake had absorbed all their competitors, thus acquiring a remarkable range of historic material, some of it dating back to the early 16th century. The irreplaceable artefacts were kept in the great basement of their Sheffield factory, known as ‘The Tomb’. Sixty years later, in 1996, after many years of negotiation with Stephenson Blake by Susan Shaw, the fount/fonts and documentation were purchased by the Type Archive, with the aid of a unique grant from the National Heritage Memorial Fund, and passed to the care of trustees. Justin Howes was appointed Registrar of the move, equipped with 15,000 bar code labels to identify each tray. They were each brought up in a hand lift from the Tomb, emerging slowly from their long seclusion. James Arnold-Baker was kind enough to welcome the collection to Oxford University Press, where they were stored without charge, for two years, while the Type Archive prepared its vault. Later, in 2006, the Sheffield factory was demolished, but not before all the original cabinets and safes were removed to the TA, and each font was returned to its original cabinet by Howard Bratter. 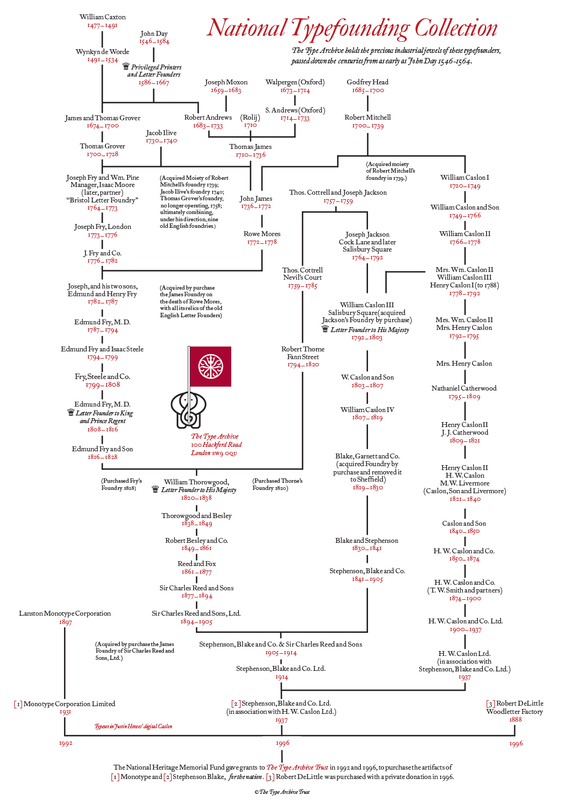 Justin Howes, the most expert scholar on Stephenson Blake, with a grant from the Pilgrim Trust, prepared a Preliminary Catalogue of the SB collections before his untimely death at 41 in 2005. It was a miracle that he completed the catalogue, just as the SB collection itself is without historical precedent. The PRISM Fund's grants for moving all the TA collections have been central to its success. The printing press depicted here is around 1680, and lacks some perspective, making the hazardous ‘bed’ of the press look as though a ‘forme’ would slide onto the floor. The array of parts of the press are given here. 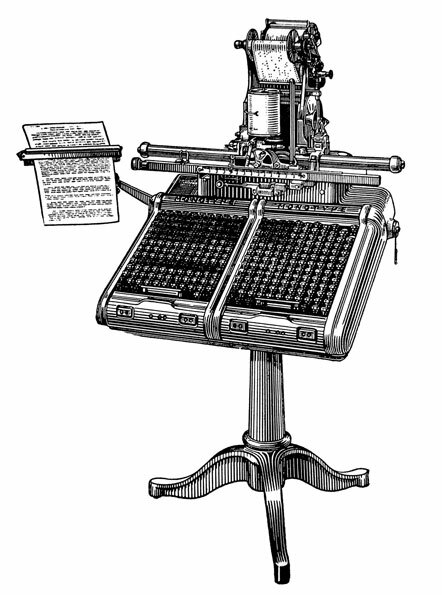 Printing presses and printing equipment are traditionally described in very human terms : a. the feet; b. the cheeks; c. the cap; d. the winter; e. the head; f. the till; g. the hose; h. the hooks; i. part of the worm below the head; k. l. the eye of the spindle; m. the shank of the spindle; n. the toe of the spindle; o. the plattin tied on the hooks; p. the bar; q. the handle of the bar; r. the hind-posts ; s. the hind-rails; t. the wedges of the till; u. the mortesses of the cheeks; x. the carriage; x. the outer frame of the carriage; y. the wooden-ribs on which the iron-ribs are fastened; z. the stay of the carriage, or the stay. 1. the coffin; 2. the gutter; 3. the planck; 4. the gallows; 5. the tympan; 6. the frisket; 7. the points; 8. the point screws. 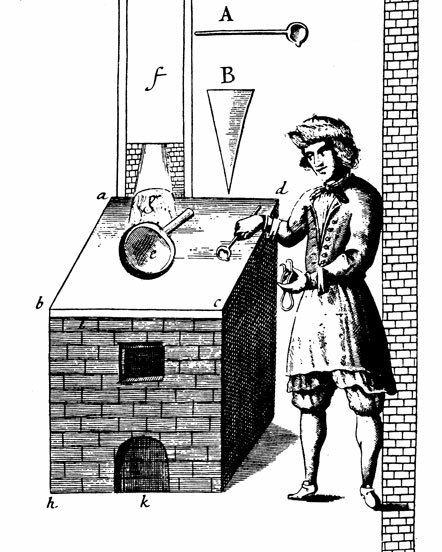 Foundry man setting up the furnace in the 1680s. A. The letter-ladel; B. the leather of the matrix; a b c d. the square stone at the top covering the whole surface; e. the round hole the pan stands in; f. the funnell (7 inches high and 5 inches wide); g. the stoke hole (4 inches wide and six inches long); h. the height of furnace (2 feet 10 inches); k. the ash-hole. The casting mould held in the founder's hand is not labelled. 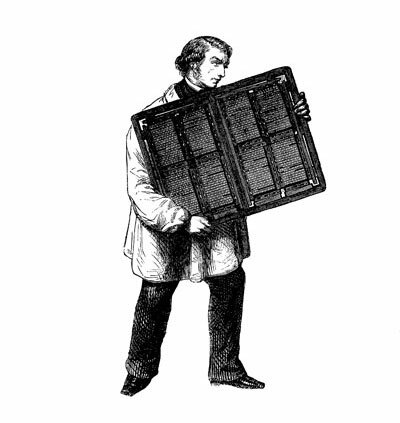 A compositor lifting a heavy ‘forme’ of eight typeset pages. The flat pages are laid out, and ‘imposed’, on a perfectly flat surface, called a ‘stone’. 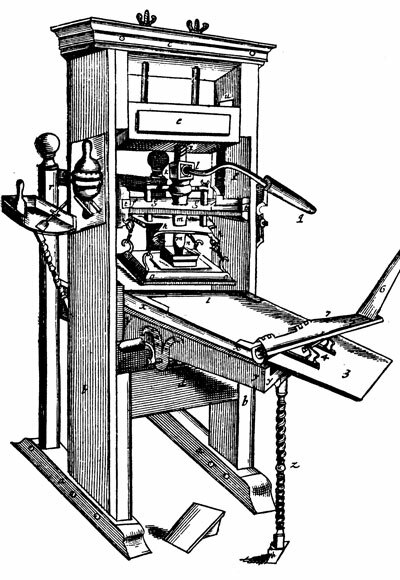 When satisfied that all is accurately positioned, the compositor places a metal frame or ‘chase’ around the pages, fills in all the gaps with ‘furniture’ and locks up each page securley with a ‘quoin’ or wedge. When complete, the chase and pages together become a ‘forme’, which is locked up very tightly and taken to the printing press. Placed on the flat ‘bed of the press’, the job is now ready to run. The machine ‘minder’, the man whose skill determines the success of the final result, then takes over. In due course the printed sheet will be ‘backed up’ with eight more fresh pages, imposed to produce a folded 16 page ‘section’, or ‘signature’. It is impressive team work. When printed, the reverse process of dismantling the forme takes place on the stone, which is called ‘dropping the forme’, an alarming term. In early printing, the compositor would routinely ‘diss’ (distribute) the individual letters back into the typecase. An exacting and unpopular job, but crucial to future accurate composition: a compositor typesetting by hand at speed, looks at his copy, not at the individual letter sections. 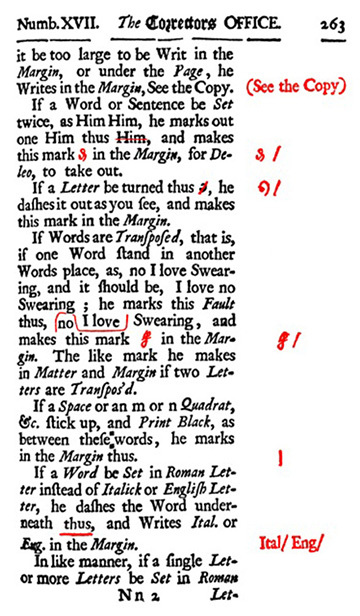 1683 proof reading in the ‘Correctors Office’ indicated little has changed in letterpress. A rough piece of entertaining printing. From its factory in Salfords, Surrey, the Monotype process, an American invention, dominated the world of mechanical typesetting for the larger part of the twentieth century. The American company supplied America and Canada; Salfords had the rest of the western hemisphere. The list of their offices abroad was awesome. When hot-metal at Monotype was finally superseded in Salfords in the 1990s by Monotype Typography and the laser comp, the TA Trust (a registered charity) was formed to acquire the hot-metal division. The scale of the rescue was spectacular. The complete archive and plant of the Monotype Corporation was purchased with a National Heritage Memorial Fund (NHMF) grant in 1992. It belongs to the Science Museum, which delegates its care and operation to the Type Archive. The Science Museum has catalogued the Monotype collection for the public benefit, which will be available on the web in 2016. This supplements the existing immaculate documentation required by Monotype to run a vast global business from 1900 for over sixty years, in 300 written languages. The Type Archive's complete Monotype archive and working plant, embody unique precision engineering skills which are now being passed on. Young people today are keen to use their hands and learn the traditional skills of hand, mind and eye. Two accomplished TA Apprentices are, together, mastering these complex skills. 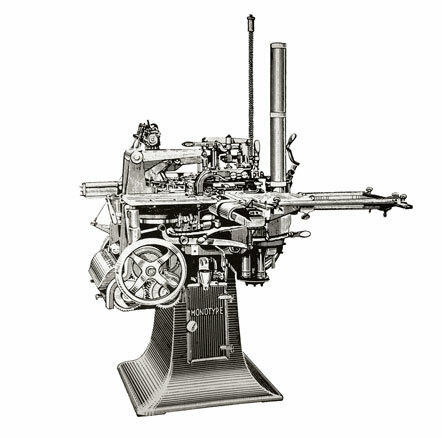 A Monotype pneumatic keyboard, run on compressed air, produces a ‘punched spool’ which programmes the Monotype composition caster, with 4,000 parts, to chatter away (like a country dance) mechanically casting lines of individual types, automatically. Inside the caster is a ‘matrix die-case’ containing the required font, in one size, which comes to life once the spool begins to signal its instructions to the caster. The smaller the point size of type the faster the caster runs. In 16 point composition type, the casting is quite slow and stately. Much faster than setting by hand, the Monotype system could set a justified four-inch line of type in less than a minute, and could run unattended, for hours. An on-site subsidiary of the Type Archive, Monotype Hot-metal Limited, has continued to make and sell new Monotype matrices to clients since 1992. It has never been without orders. The matrix workshop has the 80 machines dedicated to making matrices and runs them every week. Two precision engineering staff with unique skills continue to be responsible for matrix manufacture. The apprenticeship scheme in operation, giving training in matrix manufacture (with a detailed manual) now carries the Type Archive into the future with confidence. In 1888, Robert DeLittle set up his woodletter factory in York, and became the largest and most innovative manufacturer of wood type in this country. His market was primarily large sizes of poster types, used in the theatre, the countryside and politics. In 1996 the TA bought the plant and all the historic patterns from Jim De Little, grandson of Robert, with a generous grant from Juliet Kindersley. The collection belongs to the TA trustees. Matrix : a right-reading mould from which a metal printing type is cast or shaped (plural matrices). Typeface : a particular design of type or font : earlier spelling fount. Typefoundry : a workshop where metal type is cast. Typography : the art or process of setting and arranging types and printing from them; whether from digital fonts, metal types or other raised-surface images for letterpress printing. Punch : a steel punch, the top face of which has been engraved with a wrong-reading character, letter, figure or sign; designed to be struck into a metal blank, to create a right-reading matrix. Typefounder : a designer and maker of metal type. 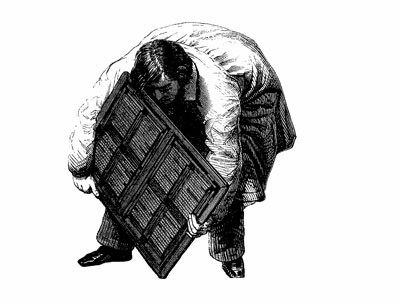 Type-high : Type is normally cast to a standard height-to-paper 0.918" (inches) 23.322 mm; woodcuts, wood engravings, lino cuts, plastic plates, polymer plates are all manufactured to 'type-high' to suit letterpress printing machines.